Rendering of imagery that video firm Obscura Digital might project onto the Mart. Art on theMART photo courtesy "Chicago Tribune"
Associate Professor of Photography Jan Tichy (MFA 2009) and Jason Salavon (MFA 1997) are among the four artists to be involved in a Riverwalk-facing video wall along the Merchandise Mart to be debuted on September 29 as part of Art on theMART's inaugural project. Art historian and executive director of theMART Cynthia Noble (MA 1996) will curate the project. Other artists participating are Diana Thater and Zheng Chongbin, both based in California. According to the Chicago Tribune, the work done by the artists will be interspersed with images from San Francisco-based firm Obscura Digital, which is associated with the technical side of the initiative. 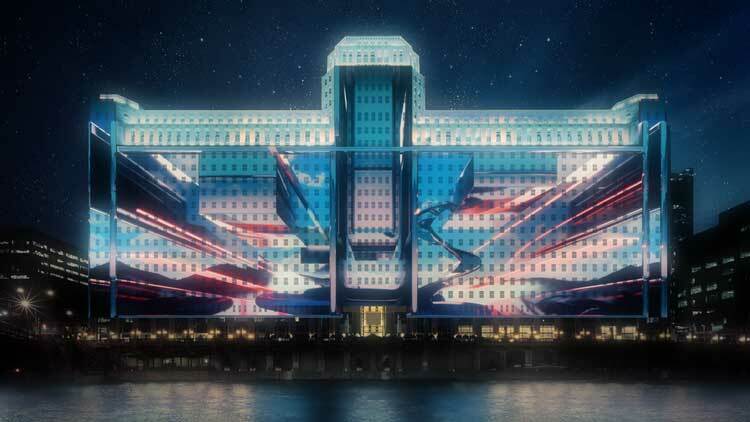 An array of 34 projectors located on a new structure on the Riverwalk will illuminate the Merchandise Mart from across the river. According to Fast Company, the display will go up every night for two hours from Wednesday to Sunday, except for the months of January and February. The city of Chicago and theMart have made an agreement to manage the project for 30 years.